The brave flower is beautiful enough but even more I love those stones. Herlig bilde! Flott komposisjon! Liker fokuset! 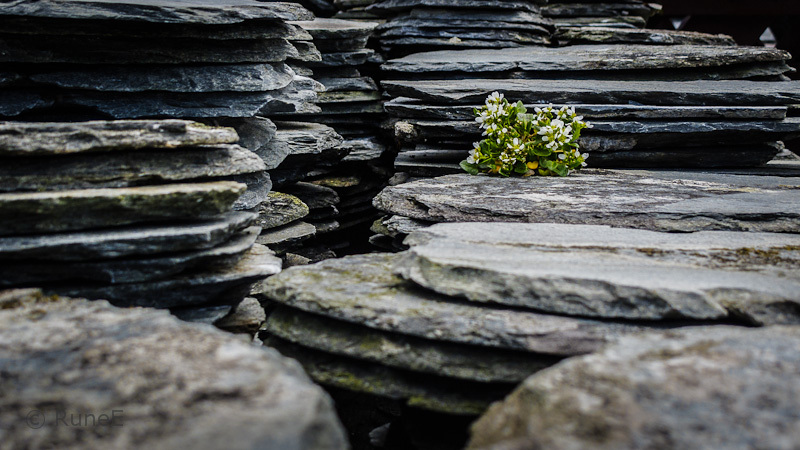 The stones are so unusual, softened by the lone flower. Nice! A beautifully composed photo. Love the tiny bouquet resting among all those horizontal lines. Strong and poetic at the same time.. That's how real vikings can be described too, knowing as well fighting than telling sagas. Perfect symbol for your beautyful country! What an awesome capture, Rune! I'm fascinated by the rocks and stone and their "layered" look! The flowers are delightful and amazing! Such a beautiful country you have!! I also love your header -- what a view!! Wishing you and your family a wonderful weekend! Great photo Rune! It really looks like that plant is growing right out of the rocks. There surely must be a speck of dirt somewhere in there. As for the stones, themselves, I love that layered look. Norway is so very beautiful and the pictures you take of everthing are just so interesting to me. You really find beauty anywhere and everywhee. The stones are so unusual to me. Wow! Those stones are spectacular. The beauty of nature. Refreshing to see those flowers. Sant nok .... Stein og blomster, en vakker kombinasjon, Rune! Her holdes kameraet innomhus, grått og regn frister ikke selv om våren lokker med nyutsprunget løv og vårblomster. Quite some stepwork here. Flowers are an added touch. What an amazing shot. The stones look like big discs and the flowers look like a bouquet left there. Beautiful . wonder how and why these rocks were stacked like that? It seems we all like the rocks! I'm seeing pancakes and poker chips. We noticed the flowers when we were there :) Also, the wild surface of Iceland produces hardy little plants in its cracks...those trips through the wilderness live forever in my heart...especially in June, the time of our visits. Such wonderful contrasts in this. Love all those horizontals. Ååh så fantastiskt vackra bilder jag hittade här! I always like seeing flowers or grass growing in places one wouldn't expect. The stone plates look wonderful! Beauty in them thar rocks Rune. I'm often amazed that plants can grow in places that I would consider inhospitable. RuneE, flower or plant seeds have a way of finding just the right location to germinate and take root. Great capture. Rune, I love this photo just as much as i love your coutry. The composition of the contrast between "dead" gray lines in the rocks and "life" in the form of the flower is brilliant. Excellent photo! P. S. Happy Syttende Mai!